When I initially purchased my Pashley Guv'nor about 6 months ago I was not quite happy with the stem and handlebar setup. My Guv'nor was delivered with a Japanese made Nitto Technomic brushed aluminium 130mm reach stem and chromed steel inverted moustache handlebars. Nitto stems are brilliant, and of excellent quality as Japanese parts always are. 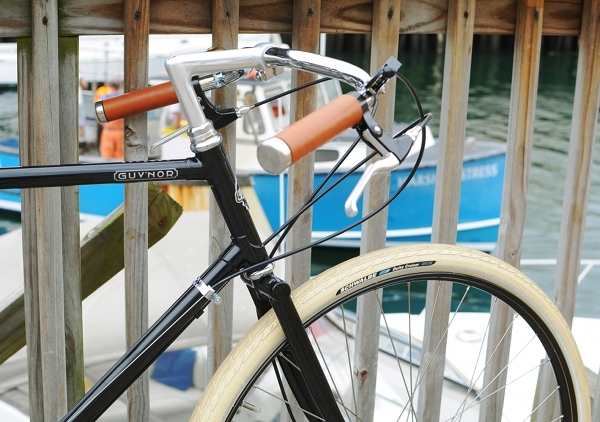 The standard Guv'nor Nitto stem setup. This combination was neat and functional, and captured the essence of the 1930's path racer styling, but for me it just wasn't quite right....probably because of the dull brushed aluminium (stem) and shiny chromed steel (handlebar) combination - for me the materials and finish of the two components were mis-matched. Furthermore, aluminium bicycle components did not surface until the late 40's after the war, so the brushed aluminium finish on the 1930's path racer just wasn't right! I understand that the earlier Guv'nors were also fitted with a brushed aluminium stem, the Cinelli XA model, and the same chromed steel moustche handlebars, this combination also presented the same material mis-match issue. 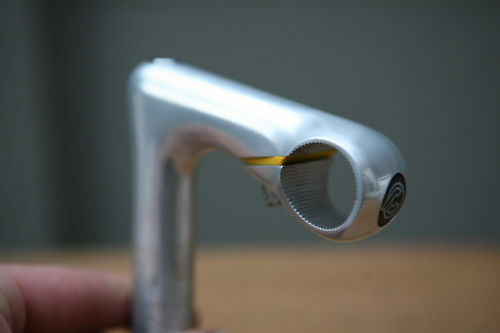 The Cinelli XA stem - nice but not quite right! This wasn't a bad looking combination, however, the wider Lauterwasser bars presented another problem to the setup. The extra handlebar width put extra pressure on the aluminium stem which was not quite rigid enough, allowing the handlebars to rock from side to side a little too much for my liking. ....so I really needed to get hold of a chromed steel period stem. The hunt was on! After looking around and making a few phonecalls I managed to find a new old stock chromed steel stem from the 1960's, 22.2 quill diameter, 25.4mm clamp diameter, 70mm reach, finished with as new chrome. It was a "Malvern Star" OEM item that was laying around on a shelf in a bike shop in Melbourne. Lucky me!! I had it sent over and fitted it to the bike with the Lauterwasser bars. Malvern Star chromed steel stem. Chromed steel bars, chromed steel stem............this was the right combination I was looking for and it looked a treat.....and because the stem was made of steel it provided the handlebars with better rigidity and less flexing.....a solid all steel ride, just brilliant! 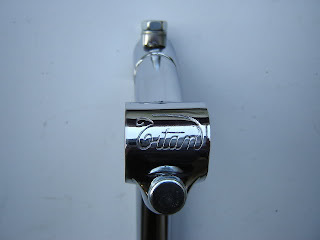 After a few hundred kilometers riding around Perth I was very happy with the new handlebar setup, steel on steel, and a nice firm ride....then one day whilst having a look at vintage stems on eBay I spied a new old stock Titan chromed steel stem! WOW! It looked great, it was the exact size for the Guv'nor - and with a longer quill for more height, and it would suit the Guv'nor perfectly. 180mm quill height, 70mm forward reach, 25.4 clamp mm, 22.2mm quill diameter. 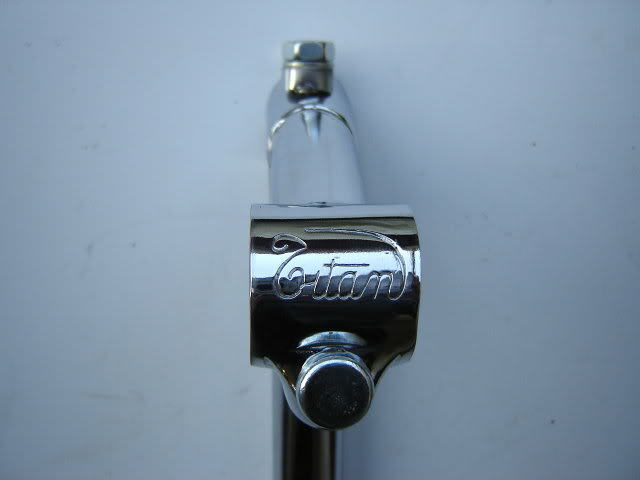 Titan chromed steel stem - a work of art! 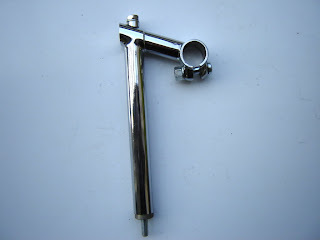 According to VeloBase.com Titan stems were made in Belgium between the 1960's until the 1980's. If you do a Google image search on "Titan stems" or have a look at VeloBase.com, I'm sure you'll be suitably impressed with them. I got the stem from eBay and replaced the old "Malvern Star" chromed steel stem - I had planned to use the Malvern Star stem for another project anyway. After fitting the Titan stem I gave it all a good polish and dropped some red enamel paint into the engraved Titan logo on the front of the stem. 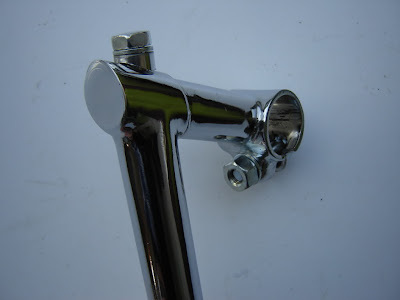 Here are some images of the fitted stem for you. Titan stem and Lauterwasser handlebars - a nice combination. ﻿I've ridden this setup for a couple of hundred kilometres now and it certainly does ride very well, and for me the combination of chrome on chrome is more aesthetically pleasing and truer to the period of the bike........but of course, each to their own! Perfect match, including the 68° stem angle parallel with the ground and the short forward reach to balance the ''voluptuous'' Lauterwassers, details taken for granted nowadays! !